The boys are clearly more excited than their dad! Wedding proposals should always be special and sweet. Over the years, we’ve seen a lot of wonderful ones on the internet – from that epic underwater proposal to the geeky Monopoly-themed one and to many others. Needless to say, we all know an effective proposal requires a lot of thought and preparation. It is, however, a big mistake to think that you have to spend a fortune just to make it a memorable moment. 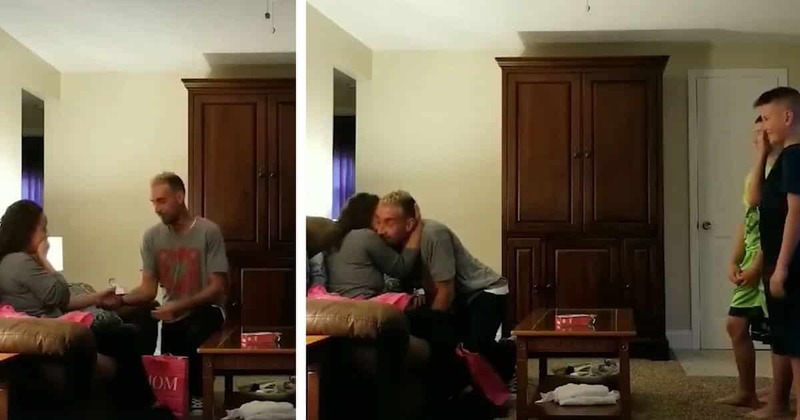 Just take it from this dad who managed to make his proposal simple yet extremely heartwarming. One father asked his three sons to help him propose to his girlfriend – during her birthday! 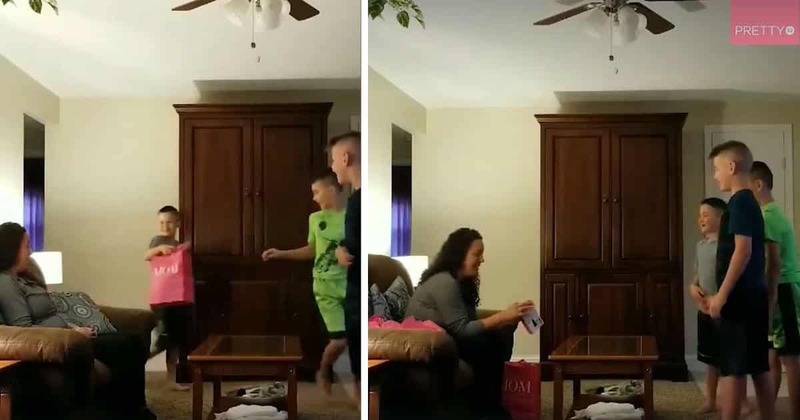 Shared online by Facebook page Pretty 52, we see the tender moment that three young boys surprised their dad’s girlfriend with a birthday present. She initially thought the boys were probably pranking her or something but unknown to her, that gift would be a pretty life-changing one for all of them. Everything was caught on film and the short clip eventually went viral. Netizens everywhere just loved what they saw and many even admitted that the video sent them to tears. Several commenters took the time to share little details they’ve noticed while watching the clip. We are wishing and hoping for that as well. Congratulations Steve and Theresa! As parents, it is our obligation to look after our children and make sure that they are happy. We buy them clothes, send them to the best schools, and, yes, give them stuff for their birthdays. But as time goes by, our children think of ways to reciprocate the love we give to them. This is exactly what an 11-year-old did to his father. 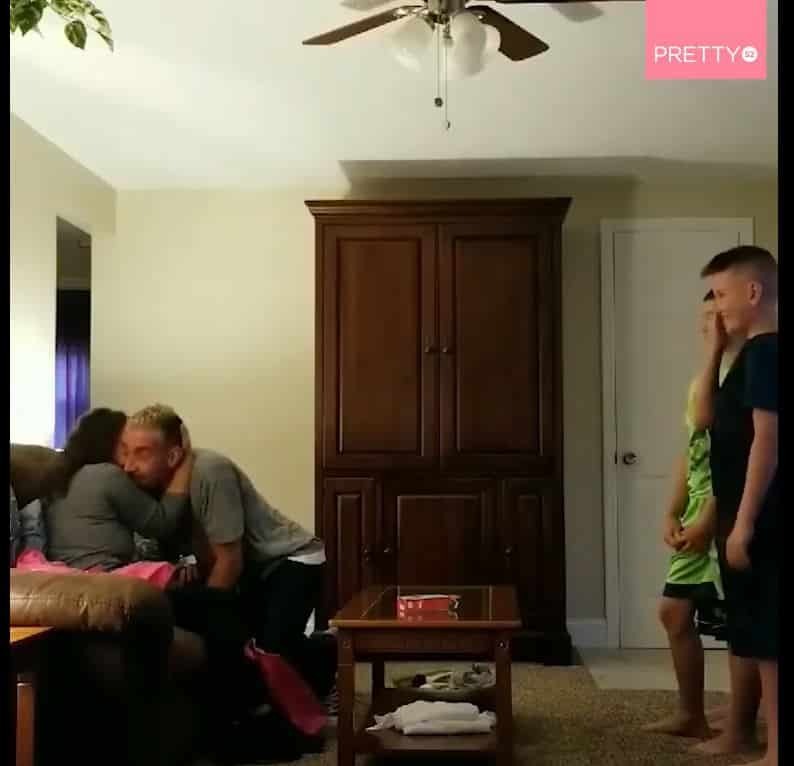 The lovely moment was caught on tape in which the father can be seen receiving a present from his son. And boy, he sure is excited to see what his kid bought him. He is one happy father indeed. This baby is a medical miracle! Thanks to the advancement of medicine, the baby who was born twice is now growing healthy after a year. Baby Lynlee Hope’s case is one for the books after she was born two times last year because of a rare congenital condition. Surgeons removed Lynlee Hope from her mother’s womb at 23 weeks and received a crucial operation after a sonogram showed that she has a massive tumor at the base of her spine. The tumor was as big as her head and doctors revealed that the baby may not make it in full term if the tumor is not removed. Baby Lynlee Hope is now growing healthy after she was born twice last year. Even the smallest act of kindness means the world to those in need. As the famous adage goes, "The smallest act of kindness is worth more than the grandest intention," and this can be certainly applied to real life. People often go on with the flow of life and with it being fast-paced, they seldom realize that everything goes back to the smallest of things. Some may perform small acts of kindness, not knowing that this has a great impact on the other person. Let's face it, sometimes, we have no idea that our simple actions may mean so much to others. Like what happened to a 16-year-old intern in upstate New York. He befriended a homeless guy named Ivan who stays outside of his office building.